I originally wanted to write a wiki—and bypass printed books altogether, but I didn't get my wish. So instead, I'll be following developments on the various cases, marketing campaigns, and eco- innovations in the book via my blog, Twitter and Facebook page, as well as via Linked in. So please be sure to subscribe, link and follow, as appropriate. Feel free to send news of your own initiatives and I'll try to communicate in this and my blog pages—as well as consider for the next edition! 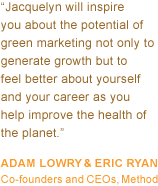 Join with us to discuss how ideas from The New Rules of Green Marketing can be applied to any company's marketing campaigns by joining the special New Rules of Green Marketing LinkedIn Group. Please link here to get in on the discussion. In the last minute goings on as we went to press, I made the mistake of including an earlier version of the chart from Procter & Gamble, rather than the updated version they kindly provided. The chart, which will be included in the next printing, is attached here, and shows numbers for energy-related LCA data across a number of products categories. Although the data show improvement in P&G's performance, the findings are directionally similar: for key product categories such as shampoo and laundry detergents, significant energy-related impacts occur during the use stage, tracing to energy needed to run hot water. Would that such products didn't need water at all! (The subject of Chapter 5). Many thanks to our friends at P&G who provided us with these charts—and graciously accepted our apology for this last-minute error. In two places in the book I erroneously mentioned that the FTC revised their Green Guides (first published in 1992) in 1996, when the correct dates are 1996 and 1998. The important thing, however, is that proposed revises were published for public comment during 2010. 333 comments were received by the December 10, 2010 deadline. The proposed revisions are published here. The comments can be accessed here in their entirety. My sources inside the government predict that the final revisions will not be published until Spring 2012. Happily, the suggestions I provide in the book anticipated these comments. However, I strongly recommend that any readers who intend to use these environmental marketing claims in their marketing efforts have them reviewed by a lawyer who is familiar with both the proposed revisions and these comments. I will be updating my remarks on these developments in the months ahead. Check back to these pages and my blog. I didn't want to publish a book-book. I wanted a digital book that could be continuously updated. But my publisher talked me out of it, convincing me that I would reach more people with a printed document than with an electronic one, at least for now. So we compromised on a paperback with a matte, not glossy cover, with vegetable based inks on acid-free paper that was certified by FSC to have been made with mixed responsible sources. The book was distributed into the entire English-speaking world at the same time, so the U.K-based printer represented an ideal launching point. Ideally, future editions will be printed on demand (or not demanded in print at all), but for now, I'm happy that books are transported by boat. Electronic versions are now available, too. Check with appropriate online publishers. Viewing the book through an accountant's eye's finds that it (are you ready?) contains: 514,388 characters (the equivalent of 3,674 tweets), or 77,050 words arranged in 8,263 lines broken up into 2,018 paragraphs and 252 pages. 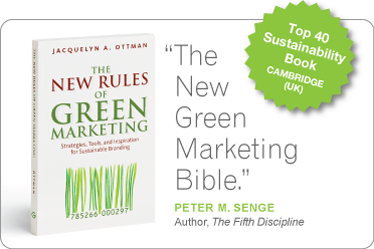 It outlines 20 new rules of green marketing, and provides 86 strategies, illustrated by 155 case examples (including three biggies, Method, Starbucks and Timberland). It also includes 24 charts and graphs, and 13 checklists with 132 bullet points to help the reader along. There's also 219 resources arranged in 25 pages, 298 end notes (so you can get more details on just about any fact in the book), and an 11-page index. I hope you find it useful. 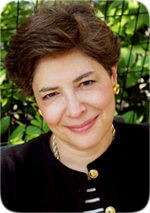 In her best work yet, Jacquie Ottman, expert adviser to the Fortune 500 and the U.S. Government, applies 20-plus years of green marketing lessons, demonstrating how such leaders as Starbucks and Method connect with this expanding market.